We have mentioned previously that couchsurfing can get your free accommodation at the next destination, but it comes with a lot of hassles. The options are hotels, renting rooms or apartments? 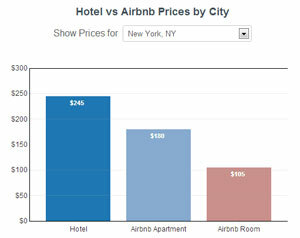 According to Priceonomics, renting a room or an apartment on Airbnb is going to be cheaper most of the time. But how much can you save? On an average, you will save 21.2% if you are renting an apartment on AirBnb and 49.5% if renting a room. 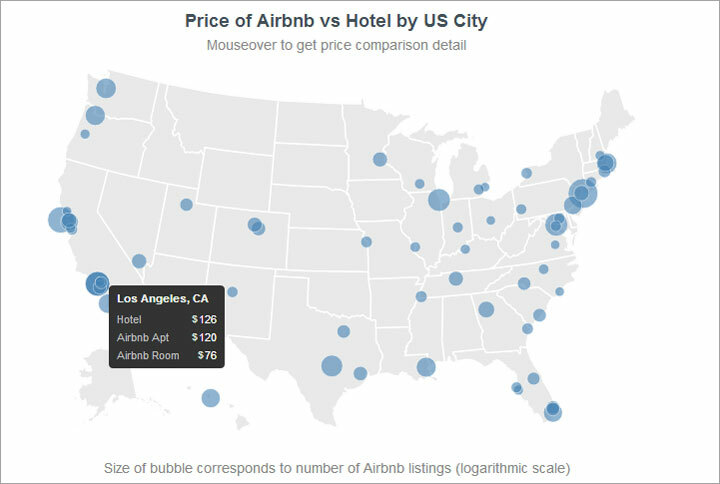 Priceonomics indexes the average price of staying in hotels in different cities (New York is the most expensive) and the average price of staying in Airbnb in various destinations (Boston is the most costly). Also see the cost of staying in different neighborhoods; for example, in New York City, it’s more affordable to stay on the Upper West Side than it is to stay in Times Square. This is a fantastic tool to determine the price of a hotel versus the price of an Airbnb apartment or an Airbnb room in select cities. Of course there are perks of staying in a hotel where you can check-in and check-out on specific, yet flexible timings, whereas for renting a room on Airbnb, you are stuck with the timings of the owner or the apartment. Note that the data is available for U.S. cities only.